Electric cars are finally starting to take off and one of the manufacturers leading the way has been Tesla, which showed that an electric car did not have to look or function like the stereotypical zero-emission vehicle. So far, the Tesla Model S and the upcoming Model Z have been expensive, high-end vehicles with price tags around $60,000. It won’t be able to change things right away but Tesla CEO Elon Musk has confirmed that the company is working to bring a cheaper version of its premium car to the market, but it may take another three years for that to happen. 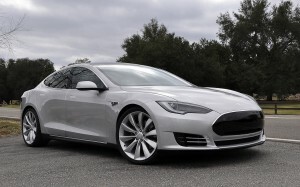 A cheaper vehicle would likely help Tesla attain a larger share of the zero-emission car market since very few people can actually afford an expensive vehicle like the company’s flagship Model S.
Earlier in the day, Musk also revealed that his company was able to sell 6,900 Model S sedans in the fourth quarter of 2013, a 25% increase in sales over the previous quarter. Despite the expensive price tag associated with Tesla vehicles, it has still been able to stay afloat but as the overall car industry moves towards electric, a consumer-friendly vehicle needs to be available. The cheaper Tesla car will come before the manufacturer’s pickup truck which Musk says would be similar in size to the Ford F-150, although that will not be coming to the market for at least another four or five years. A set of high profile Model S battery fires created a significant amount of bad press for Tesla in 2013 and while the proper authorities are investigating those incidences, people seem to forget the fact that there are far more potential issues with gas-powered cars and a handful of issues with the Model S does not mean that electric cars are not a viable option for consumers. Summary: Tesla CEO Elon Musk announced the company’s plan to bring a cheaper electric car to the market within the next three years and after that, it may even be coming out with a pickup truck.